Pompey supporters should seize the chance to watch emerging loan pair Bradley Lethbridge and Dan Smith. That is the message from Bognor boss Jack Pearce as his side welcome Three Bridges to Nyewood Lane in the Sussex Senior Cup third round tomorrow. Bradley Lethbridge. Picture: Robin Jones/Digital South/PinPep. The Blues prospects have enjoyed successful stints at the Rocks so far. First-year professional Smith has netted eight times in Bognor's Bostik League premier division promotion push – including in last weekend’s 4-2 win over Wingate & Finchley. Meanwhile, academy forward Lethbridge has scored nine goals for Bognor. His fine form earned him his Blues debut in their 3-2 Checkatrade Trophy victory against Tottenham under-21s last week. With Pompey making the trip to Scunthorpe, the Fratton faithful remaining on the south coast have been urged to head to Nyewood Lane and watch the fledgling pair in action. 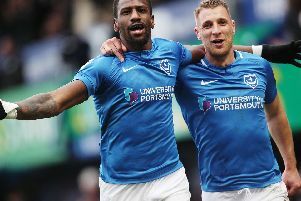 Pearce told the Bognor Observer: ‘Both Bradley and Dan are a credit to Portsmouth and we're delighted to have them in our ranks. ‘We've been entrusted to help with their development and it is a privilege to do so. ‘It's obvious they both have bright futures in the game and to pay just £6 and £2 to see them play for us against Three Bridges is a great opportunity for Pompey supporters to come along and see how they operate. ‘Plus, I think they will be pleasantly surprised at how we play the game at Bognor. 'We try to be pleasing on the eye and create chances by passing the ball.